Are you as in love with the metal signs Joanna Gaines makes for her Fixer Upper clients as I am? 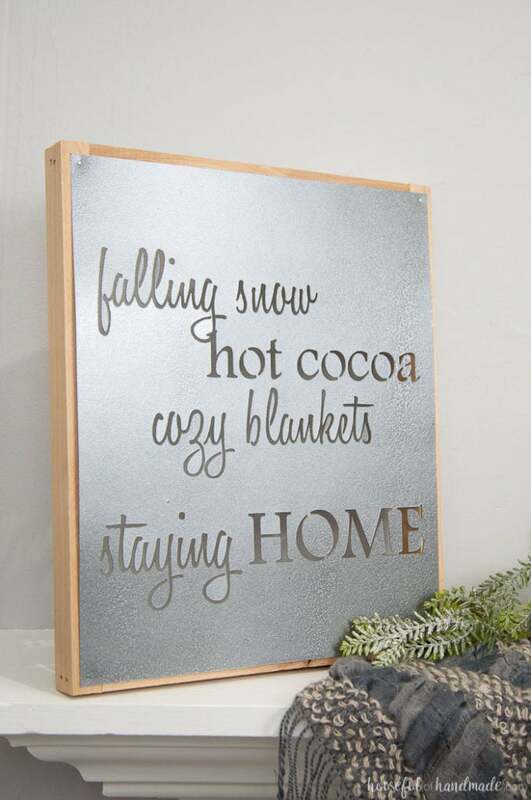 I love the simple sayings and rustic charm, but I do not have someone who can cut them for me and unfortunately my budget doesn’t allow me to buy them. So I had to get a little creative and make my own. It might not actually be metal, but you can’t tell. 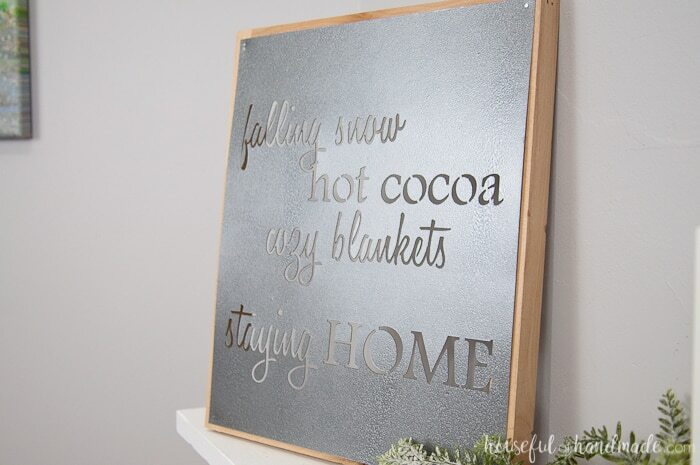 This faux Metal Farmhouse Sign is perfect for my winter mantle and I can’t wait to make more for the house! As I was putting the finishing touches on my winter mantle, I realized it needed something more. A little height was needed on the one side to balance out the faux wooden snowflake. I didn’t want it to be too symmetrical and that is when I had the idea to make my own metal farmhouse sign, it just would have to be made out of something that wasn’t actually metal. Well I know I can make paper look like metal. I did it with this Anthropologie knock-off mirror and these lanterns that are already on my mantle, so why not use the same technique to make a sign? First I had to design my sign. I wanted a fun winter saying and couldn’t be happier with what I came up with. There has been a LOT of falling snow and hot cocoa at our house this winter. 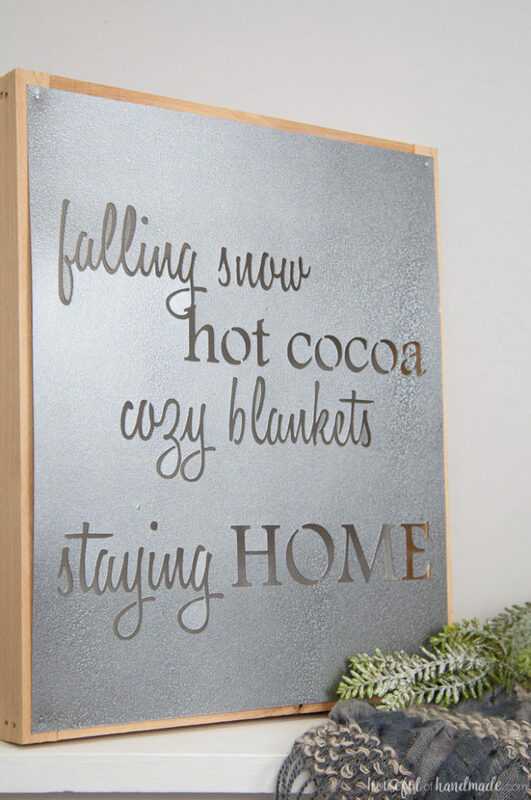 And I know I would much rather stay home and cuddle on the sofa with my kids than brave the cold. This sign is just perfect for us. I designed it so that the letters were like stencils. That way when I cut it out, it would all be one piece. Then I sent it through my Silhouette to watch the magic happen. 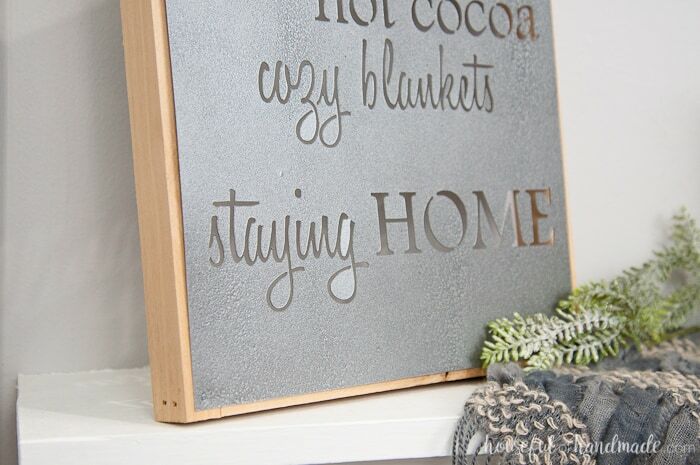 A few more steps and this perfect faux metal farmhouse sign was ready for the mantle. I can’t wait to share the full tutorial with you. So click the arrow below and see how easy it is to make one yourself. Hi! I know that this is an older project but would you be willing to share the saying. Love it by the way! I have a Cricut but would love a go at it! Soooo creative!! There is an SVG of the saying shared in the Subscriber library. That file type will work with Cricut! Thanks Cherry. I created my own stencil font by cutting out sections of a font I loved so they were no longer connected. I have always called them Stencil fonts, not sure if there is something else to call it. I should do a tutorial for how I turned my font into a stencil font huh? i kinda was thinking that you did that!….yes you should do a tutorial!!!! your stuff is beautiful!!!!! i think you are amazing…thankyou so much for getting back to me! Thanks so much Sheila 🙂 I will put that on my list of posts to share! Thank you Heather. I used the Coverstock settings, but bumped my bald up to 9 so that it would cut super clean. This beautiful and I really thought it was metal. Pinning! Thanks Rachel. I love that no one realizes it is just paper and paint. I thought it was metal, Once I read the post I was surprised it was paper! Will keep this project in mind for my Home Office. Super cool! I should do something like this for our backyard this summer. I’m not sure how it would hold up to the elements, but would be adorable in a covered patio! This is super clever, I love it. Who knew you could get that effect on card with spray paint? (well apart form you of course!) Pinning! Thanks Julie. It was kind of a happy accident and now I love painting paper! Cute and clever! I have several quotes I love and I think this is how I want to display them! This is perfect for all the quotes! Thanks Ana. Can you tell me what font you used for the cursive letters? Susan, I used a font called Honey Script, but altered it to make it a stencil.